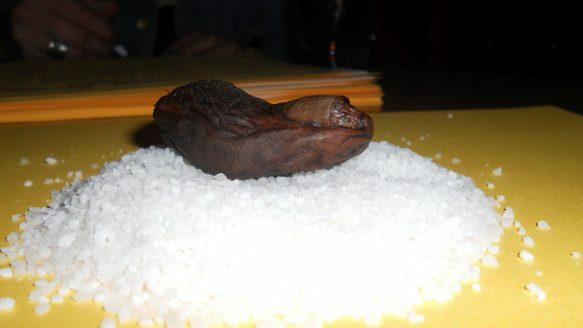 The severed human toe that is the key ingredient in the Sourtoe Cocktail is plunked into drinks, which are downed by patrons of the Downtown hotel in Dawson City, Yukon. A Yukon hotel is short one severed human toe after a man swallowed it in a glass of whisky Saturday night. “I’d never, ever expected something like that to happen,” said Terry Lee, still flabbergasted by what he saw at the Downtown Hotel in Dawson City. Lee, a local retiree who has worked as “toe captain” since June, said the latest toe was “mummified” with salt, and plunked into drinks for brave patrons about 30 to 40 times per night. More than 52,000 have joined the club, each receiving certificates and membership cards as relics of their courageous deed. Lee recommended trying it with Yukon Jack whisky. There’s a $500 fine for swallowing the toe, which Lee said is meant as a “deterrent.” On Saturday, an unidentified man entered the bar and approached Lee’s station with a shot of whisky. “This guy popped it in his mouth . . . takes $500 out of his pocket and slams it on the table and starts walking away. Earlier that night, the unidentified man described only as “Josh from New Orleans” was at another bar called The Pit, said Brodie McCrory, who works front desk at the Downtown Hotel. “Josh” had decided to leave town, and was given his rent deposit back, said McCrory. Lee, who was toe overseer at the hotel on Saturday night, said the man approached his station near closing time, and paid his $5 “toe tax” to have the amputated artifact dipped into his glass of booze. The man drank it fast, slurped the toe into his mouth, and quickly grabbed his pint of beer and chugged, Lee recalled. Josh Martin — no relation to “Josh from New Orleans” — has also tasted the wrinkly flesh of the sourtoe. He became the 36,796th member of the “sourtoe club” while visiting Dawson City in June 2010. “I still carry the official membership card in my wallet and when I returned home from the Yukon I replaced my university diploma on my wall with my Sourtoe Cocktail certificate,” Martin told the Star. “The whisky was the only thing I could taste but the toe was like a leathery piece of jerky — with a toenail attached to it,” said Martin. Now that their toe has been swallowed, Lee and his fellow captains are on the hunt for a new one. Most in the past have been donated through someone’s will, he said. One was also given to the bar after it was cut off by a lawn mower. “We’re still looking for a toe — or toes,” said Lee. And when they get one, he added, the deterrent fine will be jacked up to $2,500. Outside Lands Lineup for 2019 is here!